I cant reproduce this issue. Is it possible to send the config.xml for the jobs? Either attach them to the Jira or send it to me via email. Patrik Boström added a comment - 2014-03-16 18:35 I cant reproduce this issue. Is it possible to send the config.xml for the jobs? Either attach them to the Jira or send it to me via email. We experience the same issue with our pipeline. Version 0.7.1. Using trigger parameterized build if that would make a difference. 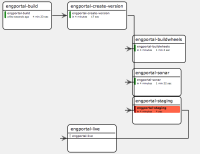 Johan Bloemberg added a comment - 2014-03-17 14:50 We experience the same issue with our pipeline. Version 0.7.1. Using trigger parameterized build if that would make a difference. I managed to reproduce the problem now. Working on a fix. Patrik Boström added a comment - 2014-03-17 19:22 I managed to reproduce the problem now. Working on a fix. Thanks, Patrik. I sent you a couple emails with lots of details about how to reproduce the bug, but I'm not sure if you got them. I replace to the emails I got when you made comments on this Jenkins ticket. The email address for you looked legit. Glad this is fixed. Does it a take a little while for Jenkins to tell me there's an update for the plugin to version 0.7.2? I haven't seen the "upgrades available" message yet. Roy Miller added a comment - 2014-03-18 13:45 Thanks, Patrik. I sent you a couple emails with lots of details about how to reproduce the bug, but I'm not sure if you got them. I replace to the emails I got when you made comments on this Jenkins ticket. The email address for you looked legit. Glad this is fixed. Does it a take a little while for Jenkins to tell me there's an update for the plugin to version 0.7.2? I haven't seen the "upgrades available" message yet. It usually takes a couple of hour until Jenkins picks up new plugin releases, but you should be able to see the new version by now. I hope that my fix has resolved the issue. Please report back the result. Patrik Boström added a comment - 2014-03-18 20:22 It usually takes a couple of hour until Jenkins picks up new plugin releases, but you should be able to see the new version by now. I hope that my fix has resolved the issue. Please report back the result. Thanks for the feedback Johan. What browser are you using? Patrik Boström added a comment - 2014-03-19 16:46 Thanks for the feedback Johan. What browser are you using? I just noticed i have two projects with similar workflow, one having this issue the other not. I will try to find the difference and report back here. Johan Bloemberg added a comment - 2014-03-19 16:52 Chrome Version 33.0.1750.152, OSX. I just noticed i have two projects with similar workflow, one having this issue the other not. I will try to find the difference and report back here.